Large Land Mammal: TIMC: "Nashville's Christian music community teams to aid children in need"
TIMC: "Nashville's Christian music community teams to aid children in need"
It boils down to contributing something small to something big for someone small. The “WOW Shares” event at the Curb Event Center Wednesday found more than 1500 volunteers from the Christian music and Belmont university communities doing just that: donating a little bit of physical effort toward the goal of packaging more than 400,000 meals for children in more than 60 countries around the world. 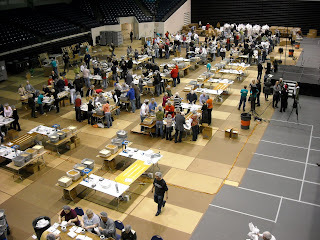 The event was aiding Feed My Starving Children, a faith-based relief organization that has dozens of these packing events at their three Twin Cities-based and one Chicago-area facilities year-round, not to mention a number of these off-site events. The Belmont event is the group’s largest single-day event to date, the continuation of their work with EMI Christian Music Group that started last year. This event with Christian music’s three largest companies -- EMI CMG, Provident Music Group and Word Entertainment -- essentially served as a de facto industry-wide Christmas party, with an emphasis placed on the volunteer work rather than just another holiday celebration. 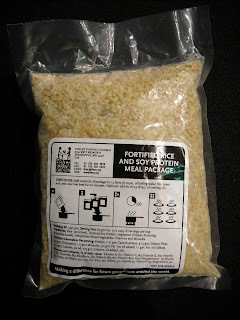 That spirit of service fit right in with what FMSC does every day. The three Christian music companies joined forces years ago to create the WOW series of compilation products, designed to highlight the best music in the industry. The “WOW Shares” initiative grew out of that 10-year-plus intra-industry relationship, and is something executives from each company hope can flourish. Additionally, the event continued the relationship the industry shares with Belmont, long a partner with the various spokes of Nashville’s music business community. The FMSC effort gave Belmont students a chance to wrap up their extremely busy fall semester with a chance to help others. Artists from each of the three companies -- Provident’s double Grammy nominee Brandon Heath, along with Word’s Francesca Battistelli and EMI’s Josh Wilson -- performed a special noontime concert for the volunteers, and Heath says events like this can help foster creativity going forward a lot more than the daily machinations of the music industry treadmill.